Did someone say sugar cookies? I love sugar cookies. I have also been inspired to do some grain free baking lately, so a grain free sugar free cookie just seemed to make sense. I have already tried doing some grain free baking with my Grain Free Blondies and my Grain Free Blueberry Tart. I hadn’t really used any coconut flour though. So today at Whole Foods, I bought some. I was so excited to use it that I baked these sugar cookies this afternoon. I knew they were good as soon as I saw my daughter lick the beater clean. If you are new to baking with coconut flour, there are some things you need to know. Coconut flour absorbs a lot of moisture so it’s good to add an egg for every 1/4 cup coconut flour. 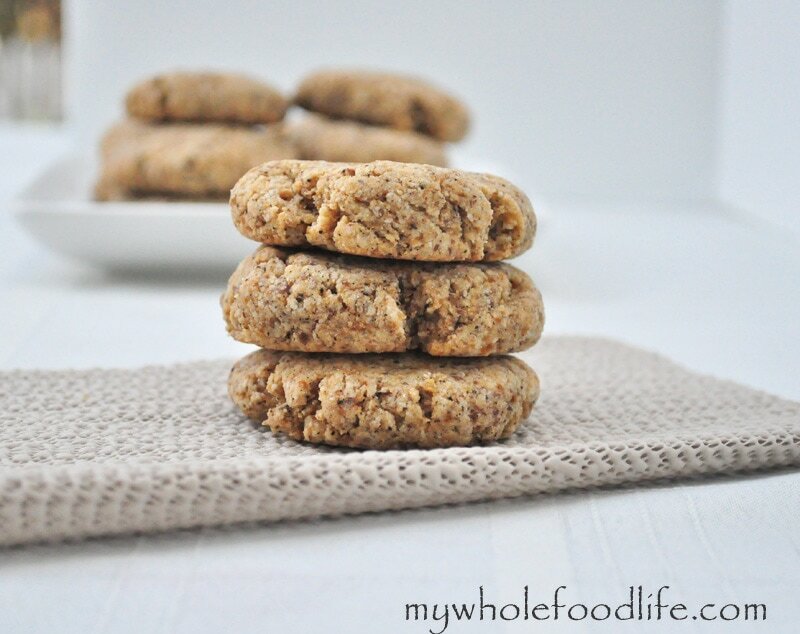 I used flax egg replacements in this recipe. I was a little worried because I have heard that if you use more than 2 flax eggs, it messes up the recipe, but I used 3 and this came out great. Mix all wet in another. Place them on a lined baking sheet , and then flatten each ball with your palm. Thank you! These are the opposite of dry. They are very moist. Cooking with coconut flour produces a much different texture that flours made from grains. I am looking forward to trying out more recipes with it. Made these today, added some shredded coconut and dark chocolate chips...tastes like an Almond Joy bar! They're are fantastic! These look great. i do not have almond flour. do you think oat flour or something else would work? Could you add any fruit to this mix? At what point would you add it? You might be able to. Fold it in before baking. for a lined baking sheet, parchment paper or a foil? Can't wait to make these! Do you think they would work well using cookie cutters? I can't have any kind of nuts in my diet. was wondering if another kind of flour would work in place of almond flour? Do you need it to be grain free? Just double checking that we can use regular eggs for the flax eggs? Still use 3? Is almond flour the same as almond meal? I have almond meal at home, but not almond flour. What could I use in place of it?